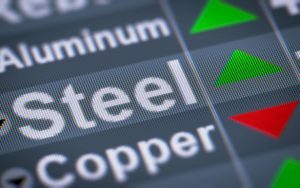 Although not yet at the coveted 80% mark, the U.S. steel sector’s capacity utilization rate is up over three percentage points in the year to date (up to Oct. 20) compared with the same time frame in 2017. Through Oct. 20, domestic raw steel production hit 76,076,000 tons, good for a capacity utilization rate of 77.7%, according to the American Iron and Steel Institute (AISI). Production during the same time frame in 2017 was 72,542,000 tons at a capacity utilization rate of 74.3%. For the week ending Oct. 20, however, the capacity utilization rate hit 80.0%, during which 1,875,000 tons were produced. Production during that week was up 10.0% from the same week last year, when production hit 1,705,000 tons. Production for the week ending Oct. 20 was down from the previous week, however, by 0.3%. According to AISI, production by region amounted to: North East: 222,000; Great Lakes: 685,000; Midwest: 197,000; Southern: 687,000, and Western: 84,000. Prior to the imposition of tariffs on imports of steel and aluminum amounting to 25% and 10%, respectively, the U.S. Department of Commerce explained that proposed remedies vis-a-vis imports of the metals aimed to bring the U.S. capacity utilization rate for each metal up to 80%. Secretary of Commerce Wilbur Ross’ report to President Trump — required by Section 232 of the Trade Expansion Act of 1962 — identified the 80% benchmark as a goal for both the domestic steel and aluminum sectors.